Does the idea of revealing your money digits to your child leave your gut a bit wobbly? Parents fear that their kids will take their financial stats and spread them around town, or that their kids will wonder why Mommy and Daddy aren’t more eager to spend in the toy aisle at the grocery store, or they’re worried their kid will compare their finances with Mr. BMW’s down the street and get some sort of inferiority complex. Really, there are tons of good reasons to not share your specific money stats with your child. Yet, any star-studded money education needs to include getting your kiddo’s hands-on actual money management tasks – the very same that not only you perform in your household on a daily, monthly, and annual basis, but that your child will perform in their own household one day. 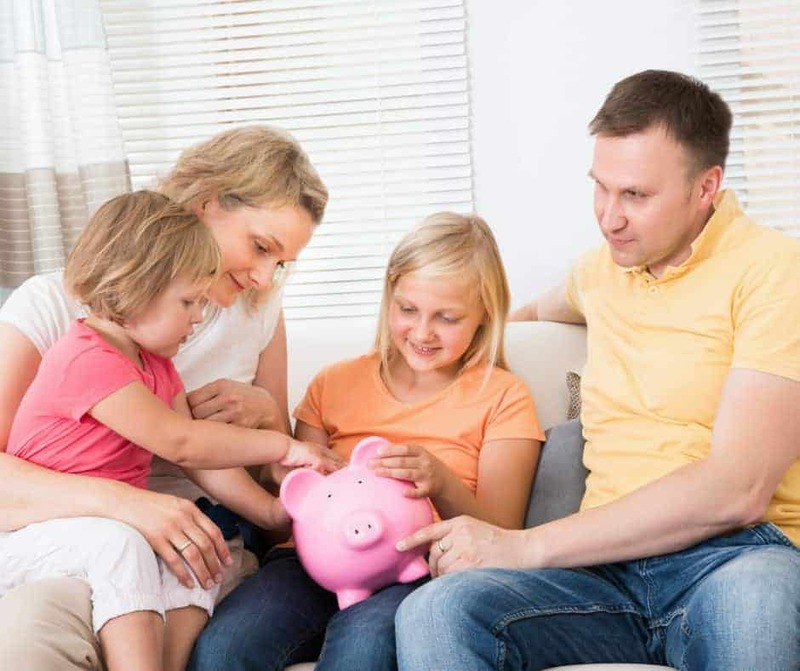 The typical money management tasks every household goes through – such as checking in on your bank account, paying your taxes, and paying down your debts – are ripe for passing down the types of money lessons you want your child to take into their adult life. This is why I talk about the need for you to normalize money management tasks in your child’s life. And it’s something that we, as parents, just aren’t doing. Think about it: your child will need to know both how to wash dishes AND how to write a check. On a bi-weekly basis, they’ll have to get in the habit of both changing their sheets AND depositing their paycheck into a bank account. So, why, then, are we not including household money tasks in the list of age-appropriate chores we hand over to our kids? If this describes the current way you’re running your household, don’t fret. Let me show you the role your child can play in your family’s money management tasks – without you having to reveal all the digits that you don’t want to – so that they become a natural part of your child’s world. Daily and weekly money tasks are probably the easiest ways to create teachable money moments. It’s really just a matter of recognizing the opportunity as it naturally pops up, and then taking the extra 10 minutes to involve your child. It’s easy to just pop into a store over lunch break without our kiddos. But I urge you to take the opportunity to involve your child. What do you need in order to return merchandise to a store? Does the store give credit or a refund? Does the refund come in cash, or to your debit or credit card? Lots of money lessons here. A well-executed grocery plan can teach your child infinite amounts of proper money management (not to mention, save a lot of money). Take turns giving them various roles to help, such as having them meal prep for the next week (they look up the recipe, make the list, clip any coupons they can find and are responsible for finding the ingredients at the store), coupon clipper, coupon scout (actually hold the coupons throughout the shopping trip and alert you when they have a coupon for a product on the shelf), take the list you make and cross off any ingredients the house already has, etc. Has your child completed their first store transaction? Have them normalize store purchases either with their own money or with yours (to begin with). It will help build their confidence as well as socially interact with cashiers. You likely check your account throughout the week. Instead of having them check your account as well (hello, too much information! ), have them check their own account either before or after you. Sit by their side when they do it, and answer any questions they’ve got. Show them what to look for, such as incorrect purchases and any interest earned. These kinds of money tasks you don’t do as often, and so you have a little time to plan for your child to be there. You might need to make a withdrawal from an ATM, or deposit a check, or do any number of things at the bank. Why not bring your entire family into this task by creating a Family Bank Day, where everyone can get their banking needs done together? It’s a great way to model taking care of your money. You’re working either gazelle-intense or at a snail’s pace (at least it feels like it) to pay off all your debt. This is the perfect opportunity to teach your child some core money lessons, but without letting them know how much debt you’ve got or what exactly all that money actually went towards. You can set up a visual tracker in your home based on percentages (so you don’t need to use an actual number if you don’t want to), and let your child help you update it on the progress you’re making towards paying off your total debt. For small biz owners, why not create your own Take Your Child to Work Day so that they can see what Mommy/Daddy do (besides type on the computer)? You can also even start a side hustle with them to show them how easy it is to make money outside of a normal job. Have your children be a part of your monthly budgeting meeting. This is a great way for them to learn the importance and power of budgeting. You can even print them out their own budget template to go over every month. You might have to scratch your head to remember all the money management tasks you complete on an annual basis. After all, you only do them about once a year. Let your child help you shop around for the best interest rates, once a year (unless you’re a rate chaser and like to get those bank account opening bonuses!). Every time I teach a kid’s money class and introduce the concept of taxes, I inevitably get the one kid who calls the government greedy. Make of that what you will, but when you do pay your taxes, why not take the time to have your child research what the heck your money is going towards? It’s eye-opening for them. You likely don’t want your child knowing your net worth. However, while you’re checking in on yours, help them gather all the info they need to start tracking their own net worth. A great way to go about doing this is using a free service like Personal Capital. Thinking back to my own childhood, I can’t remember even one time I witnessed my parents negotiating a better insurance rate, or comparing prices from insurance company to insurance company. Just having your child in the room while you talk to someone on the phone to see how best to reduce your insurance plan bill (and also to other prospective insurance companies) will put them ahead in this money management task. You can also use an app like Trim that will automatically help reduce your monthly bills for you. A final thought for you for how to get your child interested and engaged with the money lessons you want to teach: always relate your money education back to your child’s own money life (earnings, spending, entrepreneurial ideas, etc.). The easiest, and the most non-intimidating way to do this? You can take any of the tasks we discussed above, and bring it down to your child’s world. For example, when you pay your taxes, talk about how some kids have to pay taxes, how you felt when you first saw tax deductions in your paycheck and the various tax-funded goods you guys use every day (like roads, libraries, schools, etc.). Two things I know for sure – most parents don’t want to reveal all their digits to their children, and most parents don’t know where to start with teaching their kid to become money savvy. I hope I’ve helped you with both dilemmas by showing you how to get started with your child’s money education in an authentic, natural way, plus how to do so without sharing more of your personal financial information than you’d like. Hey-ooo! I’m Amanda L. Grossman from MoneyProdigy.com, where I teach kids aged 8-13 how to manage their money through Money Educational Adventures (like the Mt. Everest Money Simulation). I’m also a Certified Financial Education Instructor, and winner of a 2017 Plutus Foundation grant to bring my creations alive. We love talking about family finances over on our The Savvy Couple Community Facebook Group. Come join the conversation where our focus is family, finances and freedom! What lessons do you teach your children about money? I was fortunate to have been brought up in a family that was very good with their money and I’ve tried to pass that on to my kids. I think you make an excellent point though that being hands on with money will teach them so much more than just talking to them about it. Great post for the parents. I have a little child and I was searching such type of post to teach him about money. So, thanks for sharing such a valuable post with us!